This year begins an in-depth foray into World History. We’ll be covering Prehistory through the early Renaissance using the hilarious and information packed series: Cartoon History of the Universe series by Larry Gonick. Using the first three of these books as our spine, we’ll delve deeper into the material using a variety of living books and resources to get a deep understanding of history. We’ll be reading a variety of literature this year, from historical fiction that ties into our history studies like Gilgamesh the King and The Song of Achilles, to more literary fare like Grendel, and modern classics like Terry Pratchett’s Small Gods. Our poetry focus is on the Epic and we’ll be reading and analyzing several works like The Iliad, Beowulf, and Sir Gawain and the Green Knight. Our science focus this year will be Biology with a side of nature study. We’ll use the CK-12 Biology text (which is a thorough and free resource) as our spine for science and go deeper using several living books to enrich the text. We’ll also use The Curious Naturalist by Sy Montgomery and The Law’s Guide to Nature Drawing and Journaling to tackle a year of nature study. Your high schooler (and hopefully you the parent, as well) will keep a year-long nature journal, really honing the art and observation skills in the process. Our elective this year is World Religions and Mythology. What better time to tackle this topic than while studying the time periods that they came from. We’ll read about religions and how they came about, learn about how humanity has always had a focus on a supreme being and read about the myths early people believed. I also offer an optional Art History course. Using Gombrich’s The Story of Art and Khan Academy’s fantastic art history lessons, your child will cover the history of art from prehistoric times through the early Renaissance. My lesson plans guide you through the Level 10 school year effortlessly. Your planning is done for you so that you can spend your time on the important things, like teaching your children. 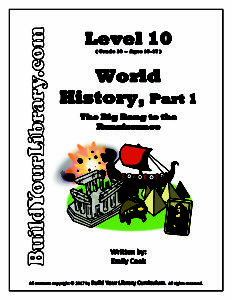 Have you already purchased Level 10 – World History, Part 1? We would love to hear what you think and share your experience with others – Please feel free to leave a product review on the Contact Us page! Thanks for your support!